The Shimano Mountain Touring Bike Shoes for Men is designed with beginners in mind. It is manufactured from a multi layered synthetic leather material that is resistant to scratching and it’s meshed for comfort and durability. It comes with a cap for the cleat positioner to help first timers get the intricacies of riding clipless with the SPD. These shoes foot bed is designed with EVA that is very thick and utlilzes a classic system of lacing the shoes for easy comfort when walking. The keeper for the loop of the shoe lace ensures they are nicely stowed away making everything nice and tidy. It utilizes the volume plus technology to provide accommodation for a wider toe area and the midsole is made from reinforced fibre glass for premium solidity. Made from durable and tough synthetic leather that is meshed for superb durability and comfort and are also resistant to stretching. Utilizes a closure for lacing for a comfortable walk and evenly distributed tension. Utilizes the amazing Volume plus technology to accommodate bikers with large toe area without compromising their comfort. Comes with a cap for the cleat positioner that helps newbies to clipless riding get used to the SPD. This shoe is a very comfortable product and is designed to make biking an easy and fun experience. They are well ventilated and do not cause the feet to become sweaty even when riding on a hot day. The design makes them versatile as they don’t look too strictly like bike shoes, it looks more like the casual sneakers. The cleat however is not recessed enough and this makes them have contacts slightly with the ground thereby causing a sound that’s not too okay. For biking, this is not an issue at all but when utilizing them for walking, that sound couldn’t be quite uncomfortable at times. Also, the lace retention system for the shoe does not make room for laces that are tight enough to give that perfect fit. 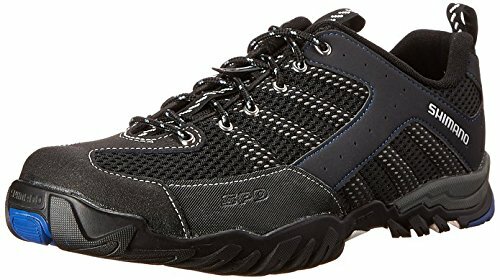 If you are into commuting around and you need a shoe for casual strolling as well as biking, then this offers a better buy.